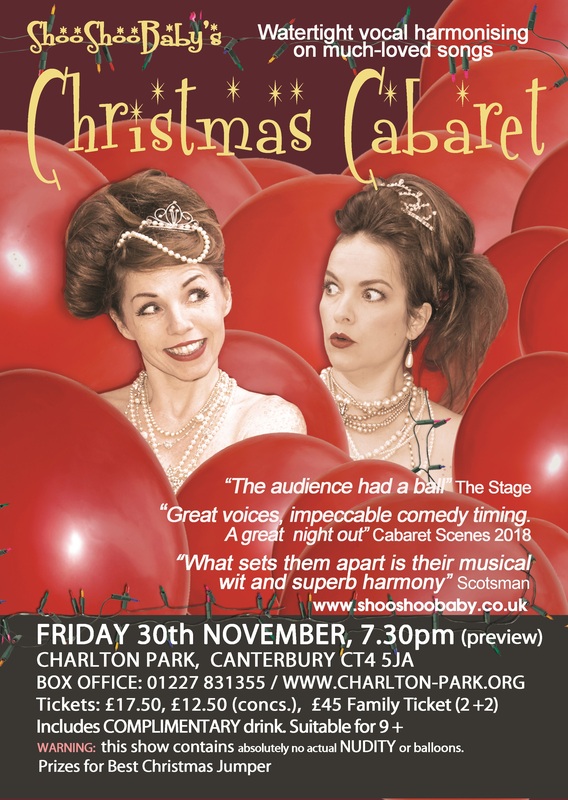 ShooShooBaby’s “Christmas Cabaret Preview”, comes to Charlton Park at 7:30pm on Friday 30th November. It's nearly Christmas and this can only mean one thing... watertight harmonies, flamboyant costumes and truly terrible Christmas jumpers. Join internationally acclaimed and “effortlessly funny” (Musical Stages) ShooShooBaby and their pianist, Jenny, for a shamelessly sparkly preview of their festive cabaret. Their acclaimed harmonising includes much-loved songs from composers as diverse as The Proclaimers, Mel Torme, Cole Porter & Queen, alongside original “witty, razor-sharp songwriting” (The Stage). ShooShooBaby – (Anna Braithwaite & Tanya Holt) have been treading the boards together for eighteen years. They have produced 3 sell-out shows for the Edinburgh Festival Fringe and appeared at venues all over the UK and abroad, including the National Theatre, Epsom Playhouse, The Arts Theatre (West End), Les Salons (Geneva) and Bar Jeder Vernunft (Berlin). They have entertained on cruise ships, jumped out of cakes and performed on ice (just the once, they are pleased to report!) and performed at venues such as The Dorchesrer Hotel, The Savoy and Goodwood House. They really enjoy rural touring, which sees them bring a bit of sparkle to villages all around the UK.